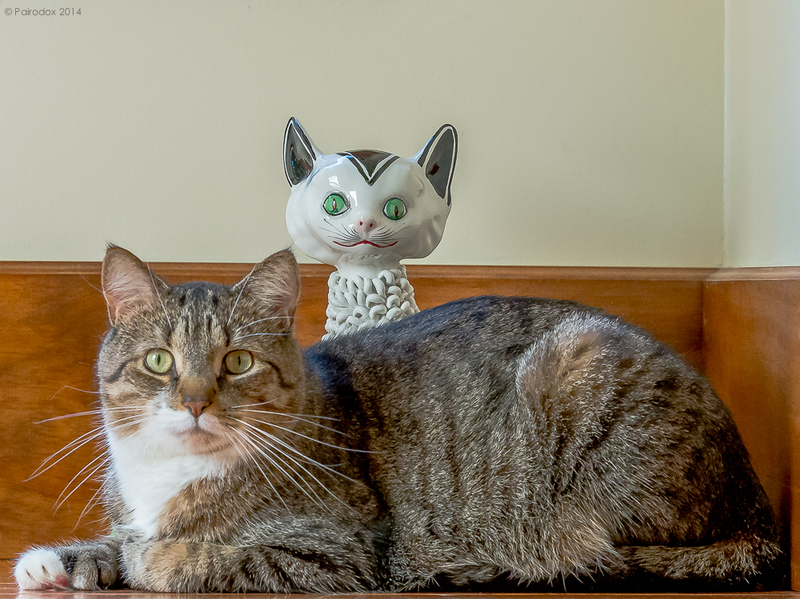 All I can tell you about the faux cat is what a Google search told me, which is that it is a ” … mid-century, Italian rope porcelain figurine.” It was a fixture in my mother’s home for as long as I can remember and lived with my grandmother for long before that. My mother is too generous with her belongings; when Joanna mentioned that she admired the piece it not-so-mysteriously appeared (three states and nearly 500 miles away from home) on our doorstep. I hope those of you who follow this blog know that I do not do cat portraits except on rare and special occasion. I thought the moment captured here qualified. Almost as soon as the ersatz feline entered the house Rugen (named after the Count from the Princes Bride) took a fancy and began spending time with her each morning. Rarely he’ll bring an offering of one or another of the toys which are scattered about but, more often than not, the two sit quietly. They don’t talk … but that’s OK with Rugen … he likes her very much, just the same.